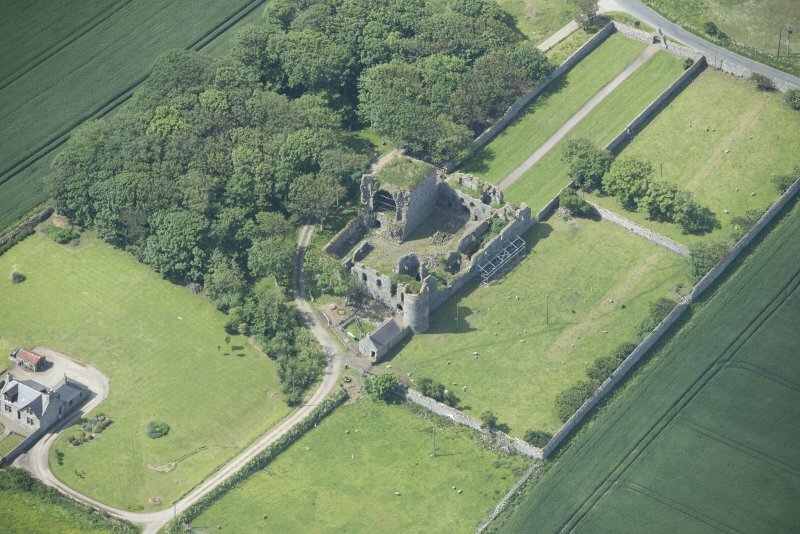 Oblique aerial view of Pitsligo Castle, looking NNW. 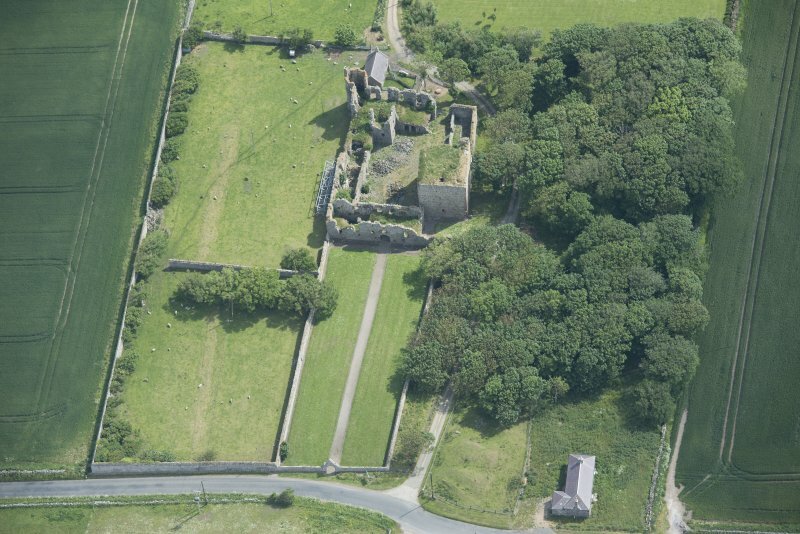 Oblique aerial view of Pitsligo Castle, looking NNE. 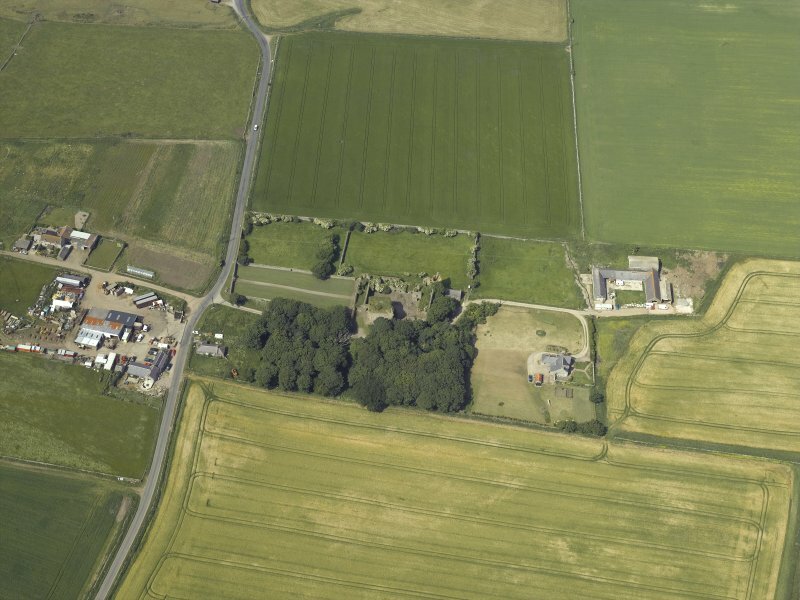 Oblique aerial view of Pitsligo Castle, looking NE. 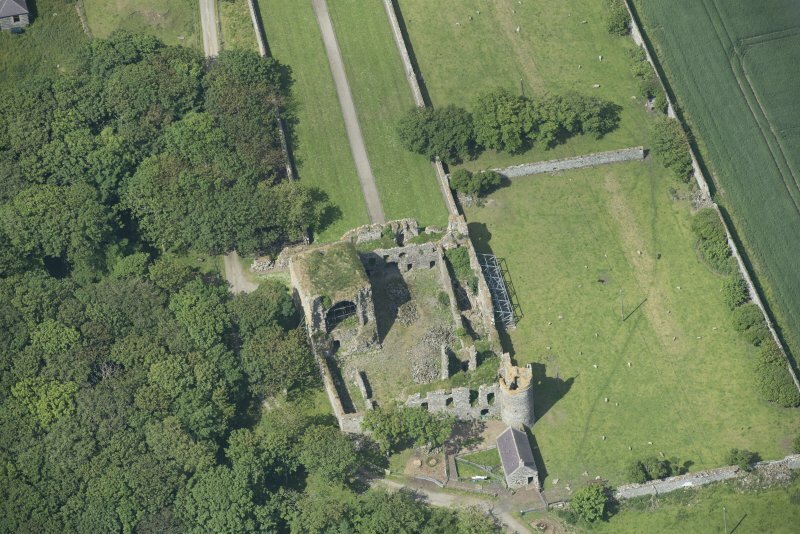 Oblique aerial view of Pitsligo Castle, looking E.
Oblique aerial view centred on the remains of the castle and tower-house, taken from the WNW. 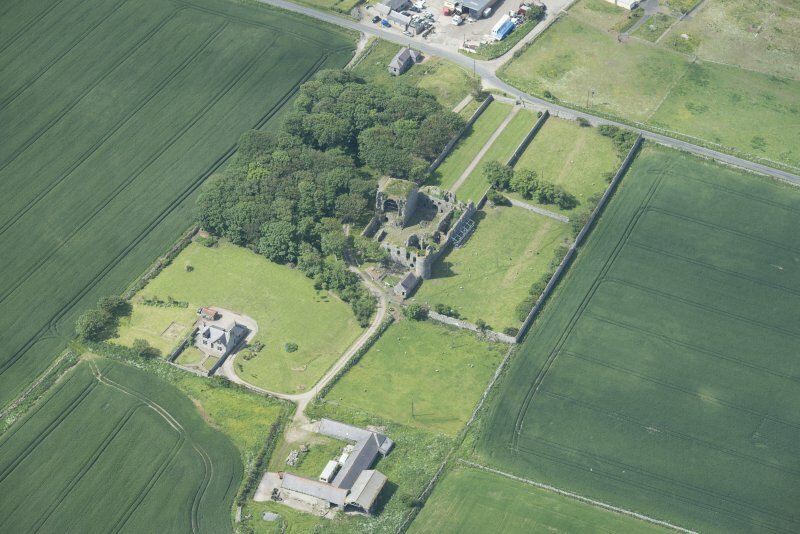 Oblique aerial view of Pitsligo Castle, looking ESE. 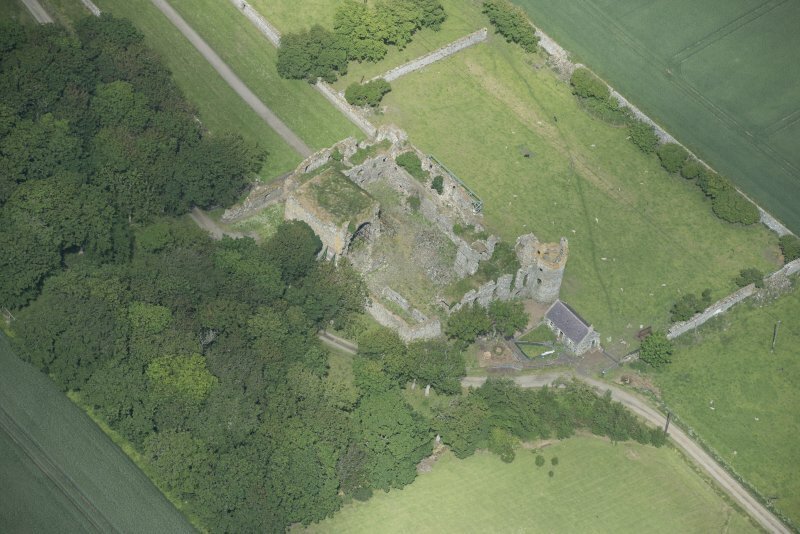 Oblique aerial view of Pitsligo Castle, looking ENE. 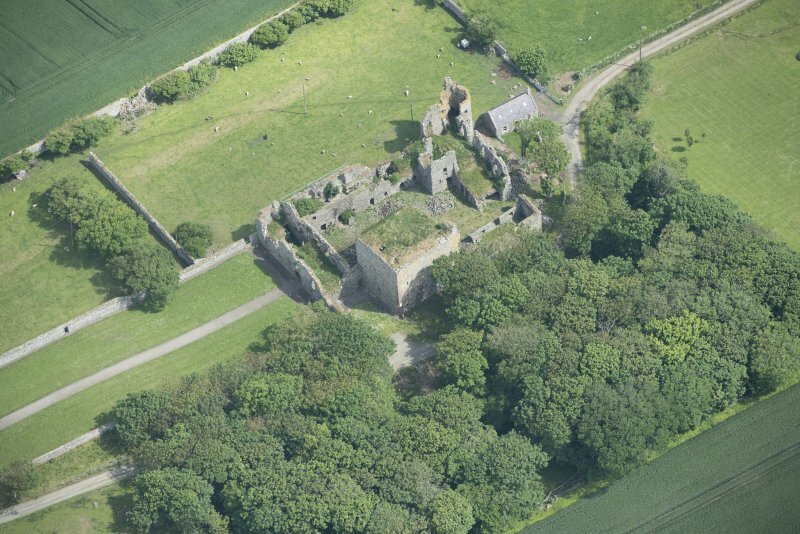 Oblique aerial view of Pitsligo Castle, looking SSE. 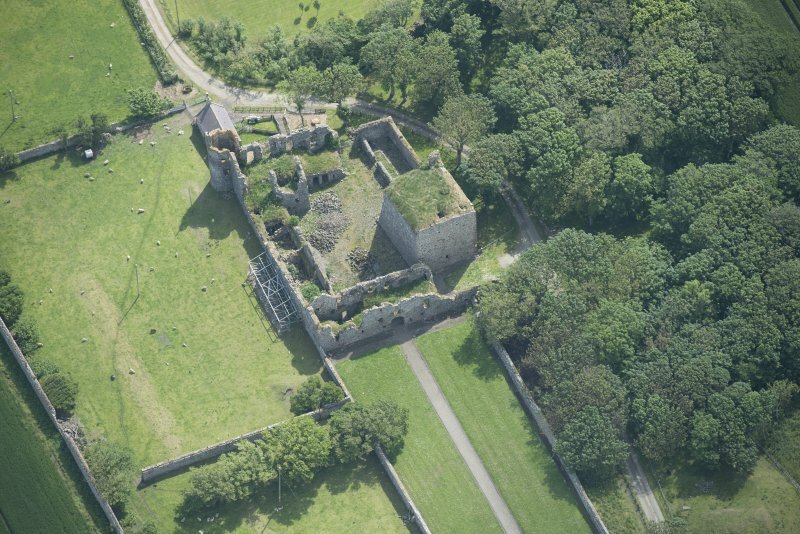 Oblique aerial view of Pitsligo Castle, looking WNW. 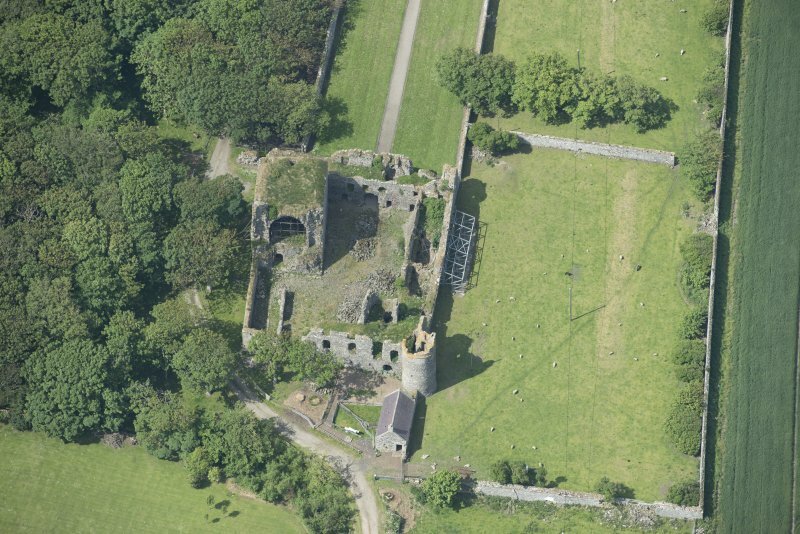 Oblique aerial view centred on the remains of the castle and tower-house, taken from the SW.
Oblique aerial view of Pitsligo Castle, looking WSW. 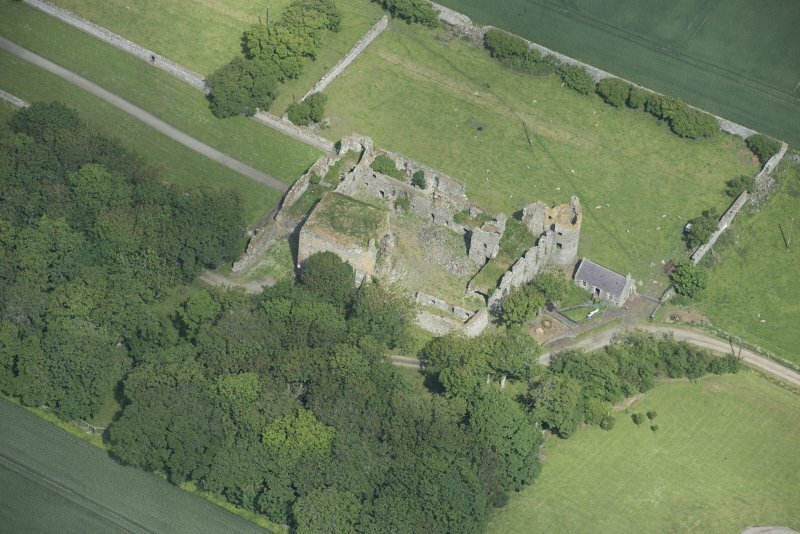 Oblique aerial view of Pitsligo Castle, looking W.
Oblique aerial view of Pitsligo Castle, looking S.
General view of West elevation from entrance gateway within West enclosure wall. Digital image of AB/2035. 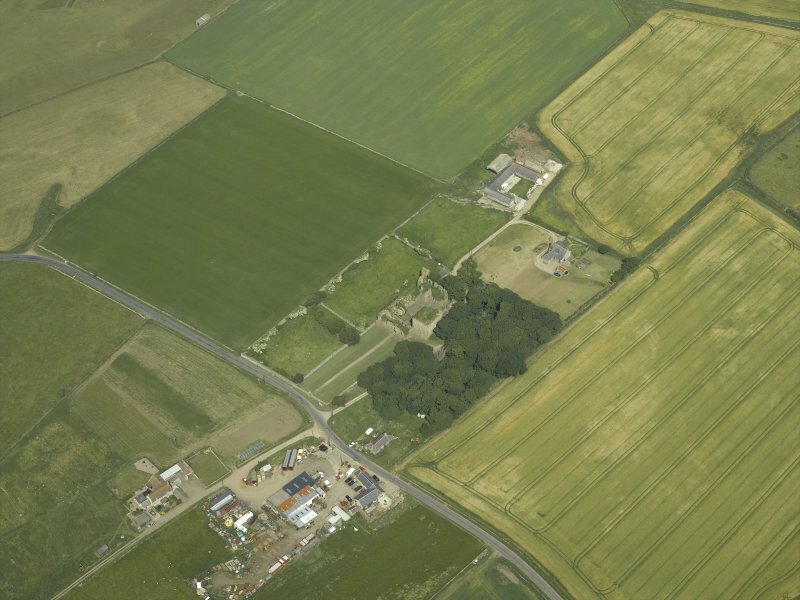 Oblique aerial view of Pitsligo Castle, looking NW. 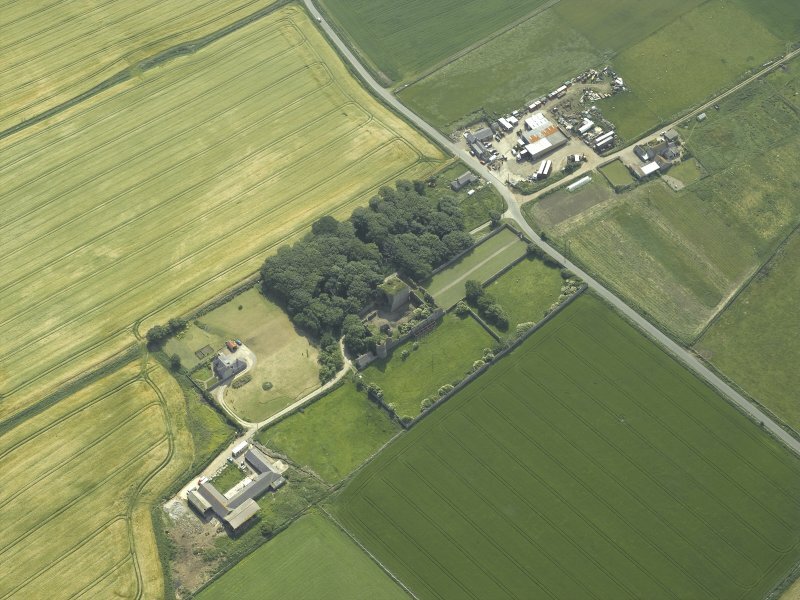 Oblique aerial view of Pitsligo Castle, looking SSW. 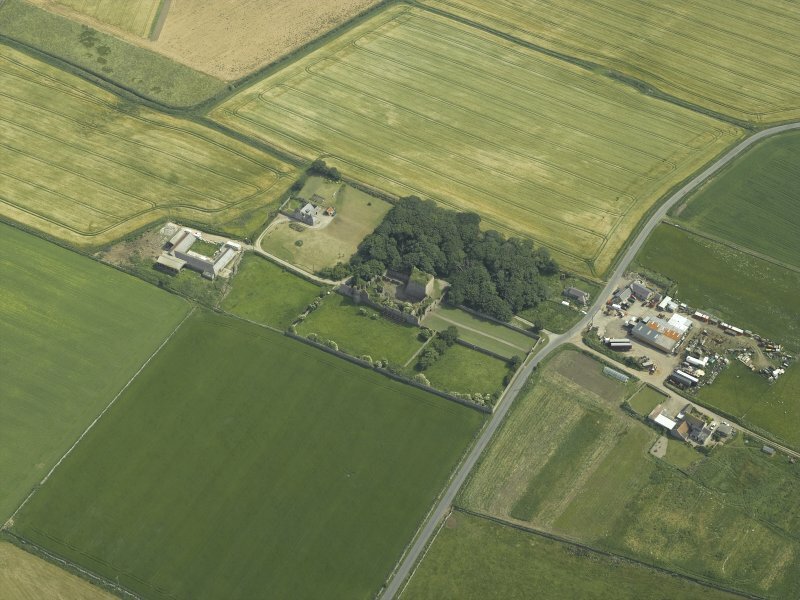 Oblique aerial view of Pitsligo Castle, looking SW.
Oblique aerial view centred on the remains of the castle and tower-house, taken from the NE. 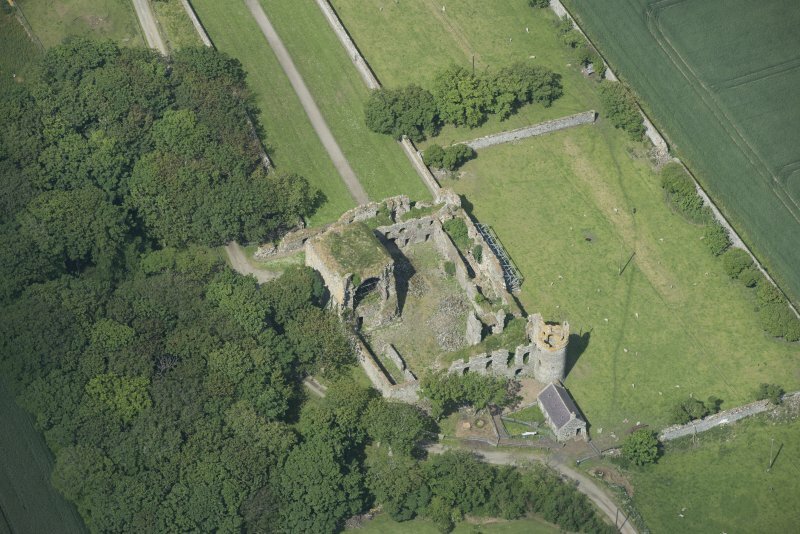 Oblique aerial view centred on the remains of the castle and tower-house, taken from the SSE. There was a large ditch round the whole house. The outer shell of the castle is intact. The buildings are roofed and in use as farm outbuildings. OS Reviser (EWM) 16 July 1955. The nucleus of the castle is a tower-house, which has every appearance of 15th century date, thought to have been built c. 1424. It is 52 feet by 37 feet with walls 10 feet thick, and survives to a height of two storeys, the third being demolished c 1700. In the latter half of the 16th century the tower-house was incorporated with a large quadrangular mansion, in which it occupies a position near the west end of the south front. This mansion seems never to have been fully completed, and encloses a courtyard measuring 98 feet east-west by 54 feet north-south. The mansion, too, is uncared for and becoming ruinous. 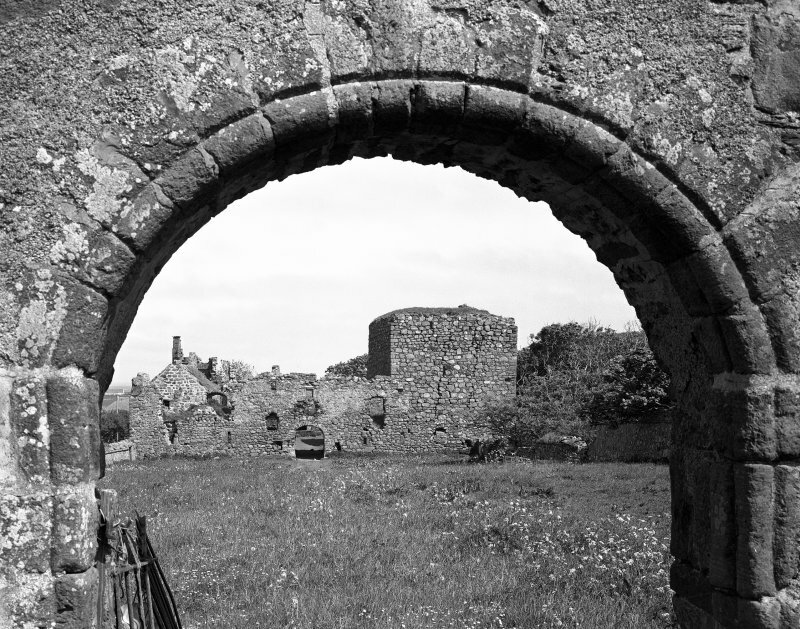 Pitsligo Castle, generally as described by Simpson, is rapidly becoming more ruinous: all the buildings are roofless. Vague traces of a possible ditch on the west and south sides, but not enough for survey. 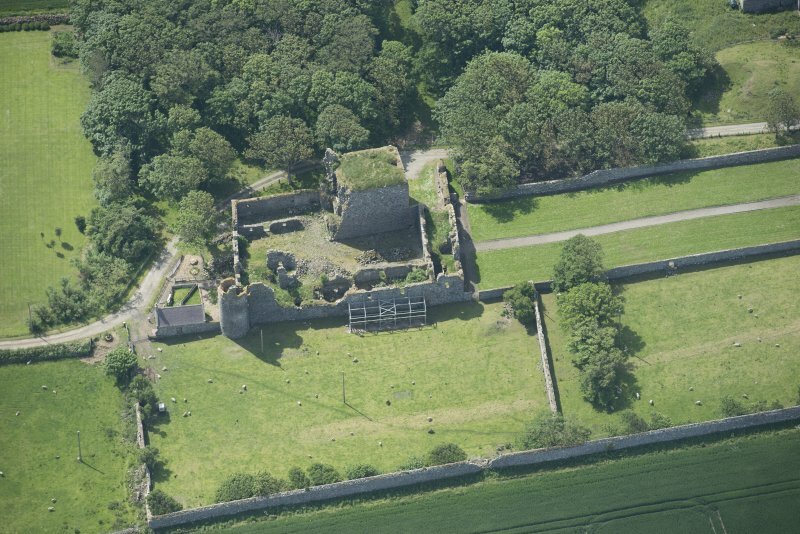 Both castle and mansion are rapidly becoming roofless; all the buildings are roofless and were in use as stock enclosures until 1988. There are vague traces of a possible ditch on the W and S sides, but not enough for survey. The tower-house is large with walls of coursed boulders; the E wall has largely fallen, and there is a straight stair in the thickness of the wall from ground floor to first floor with spiral stairs (now gutted) above. The mansion has a round tower on the exterior of the NE angle and a sqaure porch tower on the inner abgle. An entrance transe is in the centre of the W range. There are Royal arms panels of 1579 and 1603 and a Pitsligo arms panel of 1665. The large walled forecourt has coped walls; the outer gate in the centre of the W side has a semi-circular arch with edge-roll moulding and date panel HAECV CORP SYDERA MENTEM 1656 (now weathered). 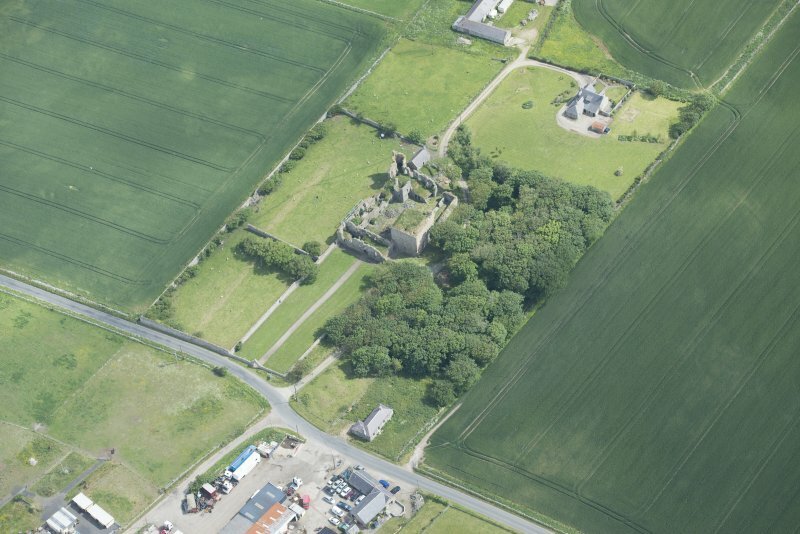 Extensive walled garden to N.
Built (c.1424) by family of Forbes of Pitsligo. 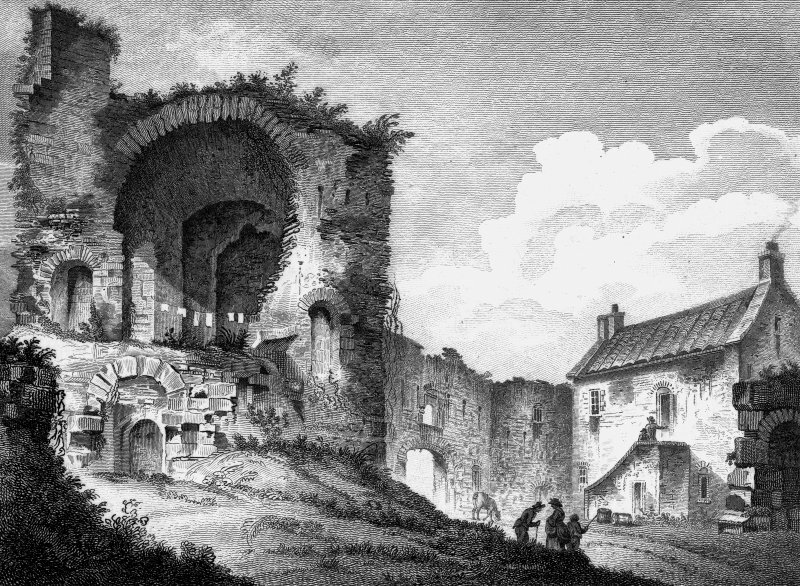 Confiscated after the 1745 rebellion, sold to the Gardens of Troup and became a ruin. Repurchased by Sir Wm. Forbes of Pitsligo later but not repaired. Consolidation programme 1988-9. Bibliographic and photographic coverage listed. The National Library of Scotland. 'The House of Forbes' by A and H Taylor. (3rd Spalding club) - text. associated with former paths or walls. 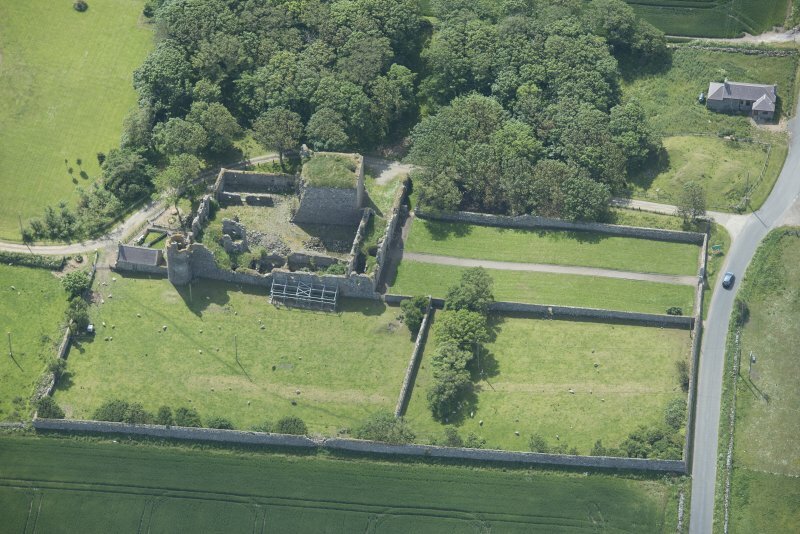 A large linear anomaly in the garden to the W of the castle may represent a former wall, while to the N a number of less well defined anomalies were identified. In all areas, interpretation is confused by the existence of a number of anomalies that may be associated with the later use of the area as a market garden. garden. 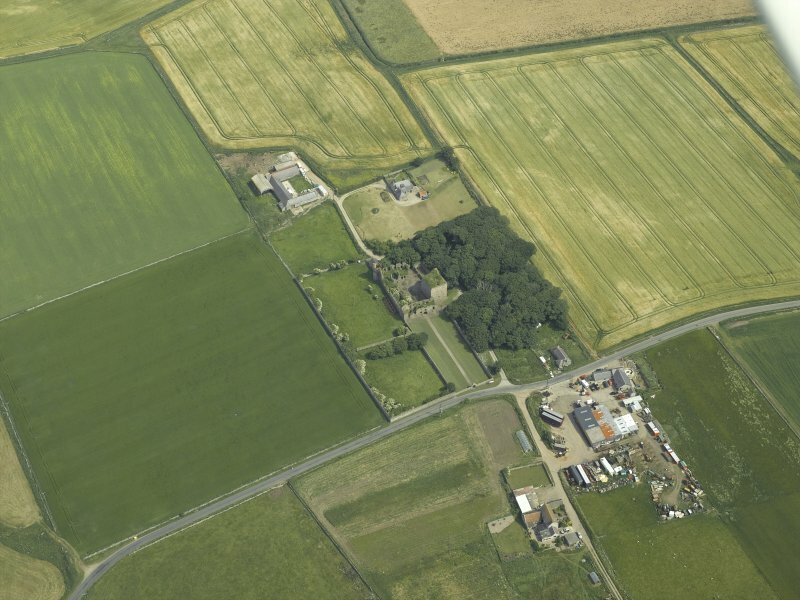 A geophysical survey undertaken by OCGU has been used to locate some of these features over a wider area (see above). 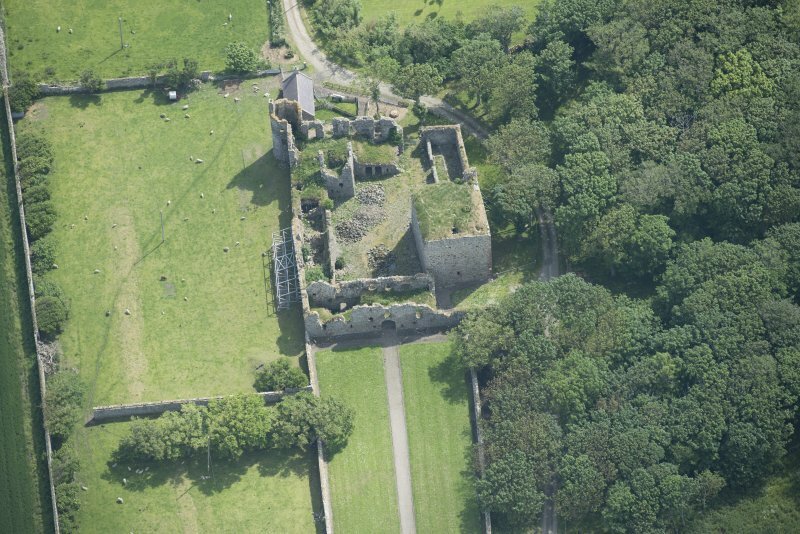 Detailed recording of the garden walls has located the former position of wall-trained trees and the fruits of existing trees are being identified. Funder: Scottish Government and the European Community Rural Aberdeenshire Leader 2007–2013 Programme, Historic Scotland, Aberdeenshire Council’s Archaeology Service and the Pitsligo Castle Trust. into the guest chambers of the N range. The drain had been re-lined with clay pipes in the 19th/20th century.